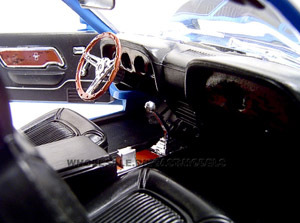 Looking for a cool diecast 1970 Boss 302 ? This is the place. I've assembled a nice assortment of the 1970 vintage super cars. 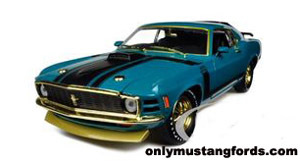 Whether your favorite Mustang Boss diecast cars are found in Grabber Blue,or Screaming Yellow, with full racing colors, these 1970 Boss 302 Mustangs are sure to make a great addition to your collection, or as a gift for that special someone. For more detailed information including prices, click the blue links. 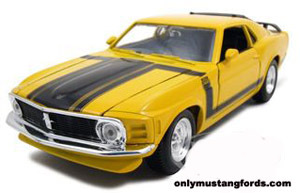 If your favorite Mustang is a Screaming Yellow diecast 1970 Boss 302 , this one just might fit the bill. It's available in 1/24 scale and features a combination of diecast and plastic parts. A great way to start a collection. This Boss, like the yellow model above comes equipped with opening doors, trunk and hood and steerable wheels. Check out this awesome Grabber Blue 1970 Ford Mustang Boss 302 . It sports a nicely detailed engine compartment. Opening the doors, reveals a finely detailed Mustang deluxe interior package. Looks great anywhere! This unique looking 1970 Ford Mustang Boss , features gold bumpers, trim pieces and accents, plus gold shifter and Magnum 500 wheels. Opening the hood, reveals the detailed Boss 302 engine and the iconic shaker hood scoop and air cleaner assembly. Its crafted at 1:24 scale. 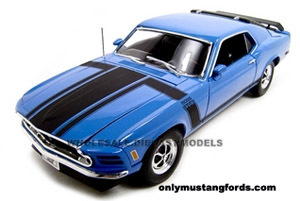 Add to your collection with the largest selection of diecast Ford Mustang cars around.